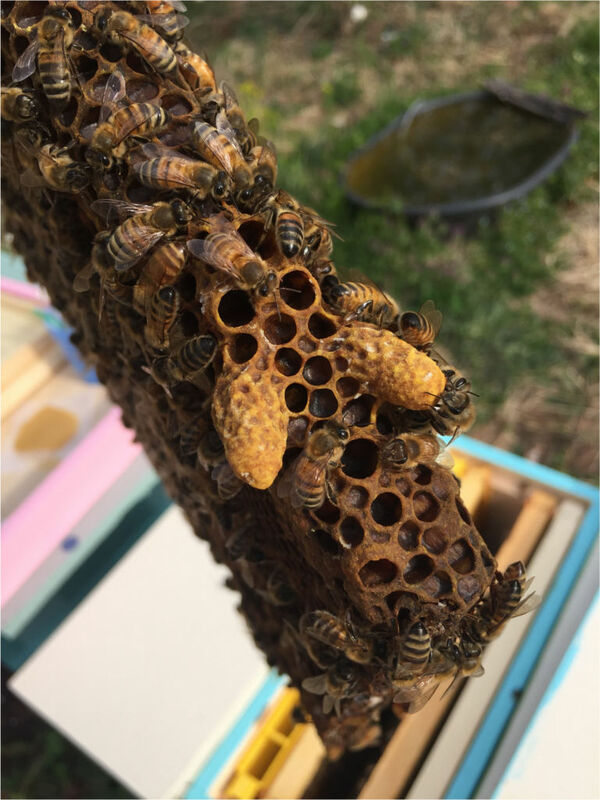 My inspection goals were to see if a new hive I split out last week was still alive (it was, and had created queen cells), and to look for brood and queen cells in my three top bar hives. Titan is troubled and Venus is okay; below is a quick update. Saturn was another matter entirely. Titan is a question right now. The picture here shows the two queen cells I found on April 14. The hive held only capped drones and no larva, so I thought maybe the queen died or became sterile. I was sure one cell had a larva, but when I checked yesterday (4/21) I don’t believe it was capped. While writing this I realized that if it held a live queen 7 days earlier it would have been capped by now, so I will have to do something about poor Titan. Venus, my smaller top bar hive, is doing fine. Yesterday she had 15 frames with bees, and 9 frames of brood. No queen cells to be found as of yet, so I inserted a couple empty bars in hopes of keeping the bees busy drawing comb rather than swarming. My big hive Saturn has frames larger than a Langstroth deep frame, while Venus’ comb is about the size of a medium frame. Even so, Saturn is bursting with 19 frame of bees and 12 frames of brood at all stages of development. 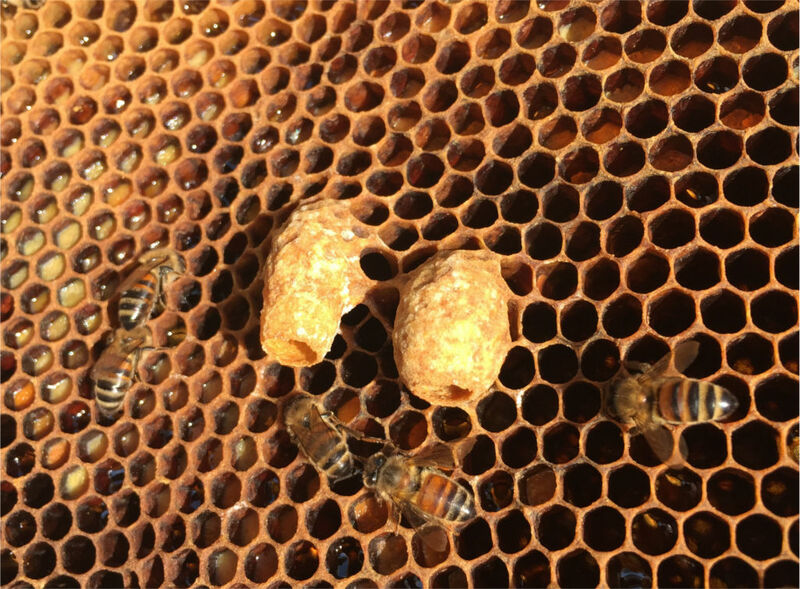 She was also packed with queen cells, many of them capped. The picture at the right shows an example. So I trudged the hundred yards back to the house to pull equipment out of the basement. 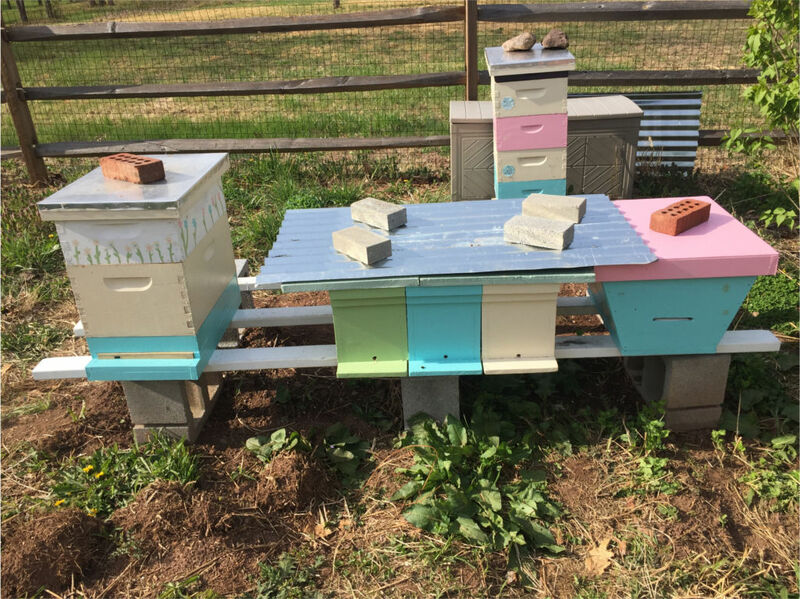 I have sold a few nucs this year and would also like to expand back into a few Langstroth hives. Saturn has been my best hive, and I wasn’t going to get a better opportunity. 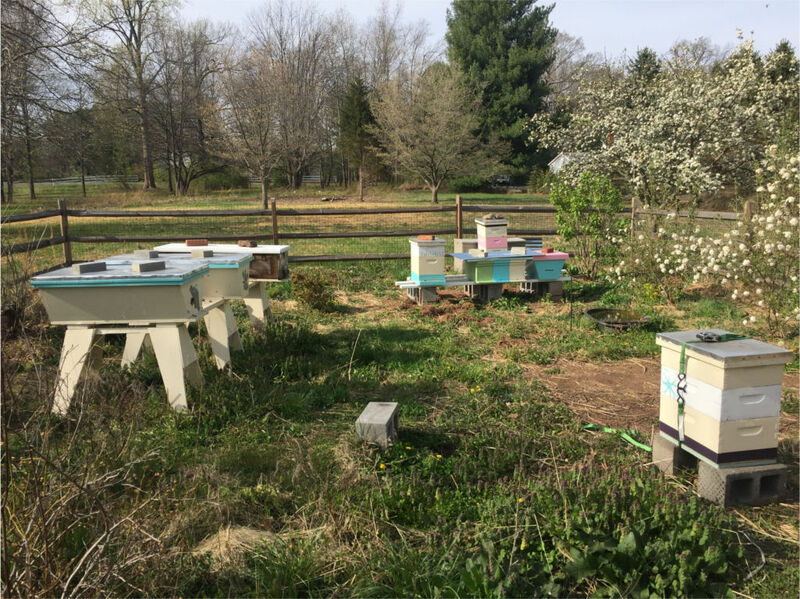 In the end, I pulled 6 frames with queen cells and created four additional hives: three nucs and one medium top bar. My bigger top bar hives have 19 inch bars so I can insert them directly into a Langstroth deep (although I did have to cut about an inch of comb off the bottom to make them fit). In addition to the frames, I shook some workers from Venus into the hives in hopes of keep the brood and queen cells warm. Normally a hive swarms after capping the queen cells. I suspect Saturn has not swarmed because our nights have been so cold. We had a freeze warning the night before, and this weekend was our first stretch of warm weather. Even removing 6 frames, I don’t think I got all the queen cells, so she still may swarm. Perhaps I should go in tomorrow and see if I can find a queen cell for Titan. Overall, it was a good weekend. 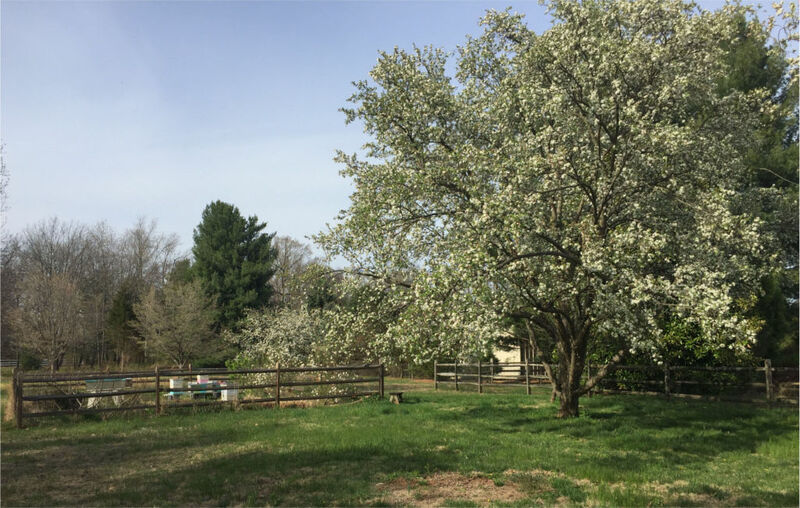 When I looked today there were bees flying in and out of all but the white nuc. We should have a relatively warm week and as you can see they are huddled together for warmth. We will see how they do in a couple weeks. This line was written by Eugene O’Neill in 1925 as part of O’Neill’s play Lazarus Laughed. The play imagines the life for Lazarus of Bethany after being raised from the dead by Jesus, as described in John 11:38-44. Tis the time to capitalize on their tendency to increase. Locally, I too have noticed what I believe is the bees being caught off guard with poor weather during re-queening efforts. This is the latest start to spring since I have been beekeeping. It sure seems that way. Our weather is forecast to be below average 3 out of 5 Days this work week.